MIAMI - Jack Ramsay, a Hall of Fame coach who led the Portland Trail Blazers to the 1977 NBA championship before he became one of the NBA's most respected broadcasters, has died following a long battle with cancer. He was 89. Ramsay's death was announced by ESPN, for whom he worked as a broadcaster for many years. 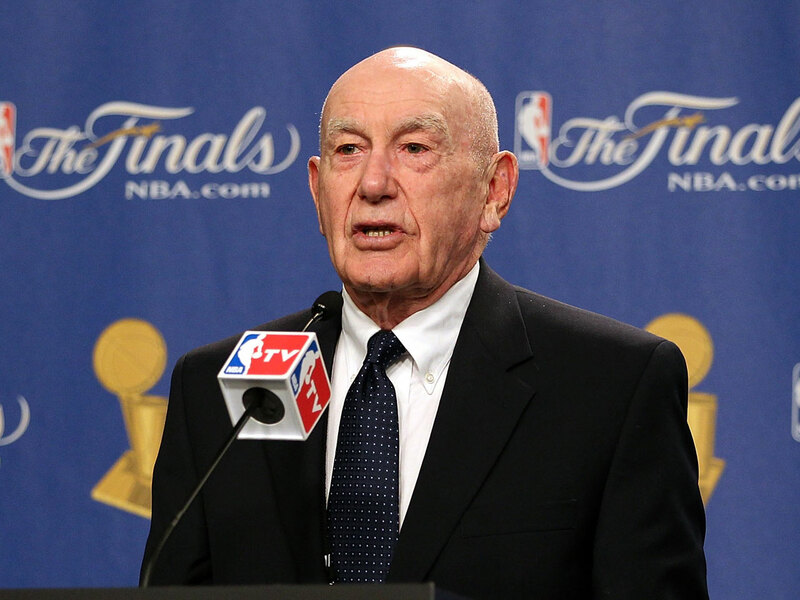 "Dr. Jack Ramsay has passed," ESPN spokesman Chris LaPlaca wrote on Twitter early Monday. "A rare man. Loved and respected by all. Fascinating life well lived. An inspiration to so many." Ramsay coached in the NBA for parts of 21 seasons before embarking on a second career as an NBA analyst. He was diagnosed with melanoma in 2004 and later battled growths and tumors that spread to his legs, lungs and brain, then later fought prostate cancer and most recently a marrow syndrome. His affinity for fitness never wavered, though. Ramsay, who competed in at least 20 triathlons during his life, worked out regularly into his 80s, even as he battled the various forms of cancer that he was stricken with. He often spoke of his love of swimming in the Gulf of Mexico near his home in Naples, Fla., or jogging in a pool or from wall to wall in his hotel room when he was traveling on NBA assignments. "He's probably forgotten more about the game than I know," Miami Heat coach and president Pat Riley once said of Ramsay, whom he counted as a close friend. Ramsay also spent several years late in life caring for his wife, Jean, who was diagnosed in 2001 with Alzheimer's disease. She died in January 2010. Ramsay had enormous popularity within the league, even until the final stages of his life. To commemorate Ramsay's 89th birthday earlier this year, Portland coach Terry Stotts wore a loud checkered jacket and open-collared shirt for a Blazers' game - a nod to how Ramsay dressed when he coached the club. "Jack's life is a beacon which guides us all," Bill Walton, who was on Ramsay's 1977 title team in Portland, told USA Today in 2007. "He is our moral compass, our spiritual inspiration. He represents the conquest of substance over hype. He is a true saint of circumstance." John T. Ramsay was born Feb. 21, 1925, in Philadelphia and enrolled at Saint Joseph's in 1942, eventually becoming captain of the basketball team there for his senior season. He earned a doctorate in education from the University of Pennsylvania in 1949, explaining the "Dr. Jack" moniker that most players and fans simply knew him by. Ramsay's biggest impact on Hawk Hill would be when he started coaching his alma mater in 1955. He was wildly successful there, going 234-72 and taking the Hawks to the NCAA tournament seven times, the Final Four in 1961 and to a No. 1 preseason ranking by Sports Illustrated in 1965. To Ramsay, the most significant part of the Saint Joseph's years was this: "I met my wife there," he said. He was a founding father of sorts for the growth of "Big 5" basketball, which is what the annual series between Philadelphia-area schools Saint Joseph's, La Salle, Penn, Villanova and Temple was dubbed. "I felt a lot of personal pride and interest in the outcome of those games," Ramsay told the AP in 2004. "There wasn't as much interest in conference play. There wasn't the impact of a national championship or conference championships like there is today. The Big 5 was clearly the biggest thing any of those schools were involved in at that point." Ramsay took over as coach of the Philadelphia 76ers in 1968, moved on to the Buffalo Braves in 1972 and took his craft to Portland in 1976 - where he took a team with stars like Walton and Maurice Lucas and delivered an NBA championship in his first season, beating the 76ers in six games in the final series. "For me, it was a once-in-a-lifetime experience and one that I will cherish forever," Ramsay in an 1997 interview. Indeed, that was his lone NBA title. Walton got hurt the next year, crippling Portland's chances of getting back to championship form during that era. Ramsay coached the Blazers for nine more seasons without another trip to the finals, and spent the final three years of his NBA sideline career in Indiana - resigning from the Pacers in November 1988 after the team got off to an 0-7 start. Ramsay was 864-783 in his NBA career, being named one of the league's Top 10 all-time coaches in 1996. When he left the Pacers, Ramsay carefully did not use the word "retire," and began working as a television analyst on 76ers games. Eventually, he worked on Heat television broadcasts for eight seasons before moving full-time to ESPN for radio and TV commentating before the 2000-01 season. "So grateful that his path crossed ours," his former Heat broadcast partner Eric Reid wrote on Twitter early Monday. "Hall of Fame coach and man."